I do not know if this has been discussed before - do not come here and post v.often - but the O2 press has been almost always at the back of my head as v. suspicious. Finally spent a lot of time reviewing this, and while analysing the pictures came to the conculsion that some of pics and vids shown from the press conf might be fake. I would love to hear what do you think! I personally think the O2 press conference was real. I just don't see any reason why they should have faked it. 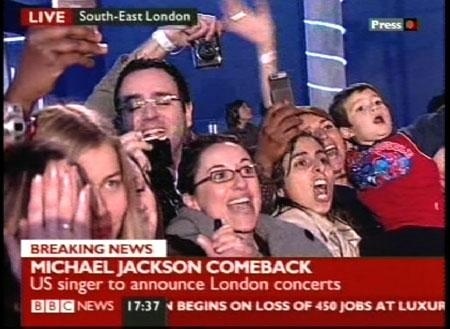 I believe it was MJ at the O2 that day too, not an imposter. I know many people feel otherwise, so this is just my opinion. The "edge" you see, IMO, is just lighting. And the blue background in that one shot is behind the fans in the photo. It just looks like a curtain/partition of some sort. We don't see it in other photos because there are no other photos (that I've seen anyway) of the background behind the fans in that shot. Again, just my opinion. I don't know. I see the edge you speak of... but it could be the lighting like she said. As for the blue... that kinda bugs me too. The other thing that bugs me is that almost every one of those people are holding up a camera/cell phone to take pictures, but try as I may, I can't find a single fan shot from this event. Also, doesn't anybody know somebody who went to this thing? London people? Do we have any here? I saw someone comment on a youtube video once saying that she was there and that it was all real, but that's the only thing I've come across as far as possible live witnesses go. I once posted a link on this forum where the article discussed that only 150 people attended that announcement, which is a big difference to the many people that these pics show. If i can find the article again, I will edit my post and add the link. I believe that the conference was real and that there really was Michael. But for me is the fact that Michael was strange that day and so I came to the conclusion that it was a performance on the part of Michael. To me he was staging upon that stage. I would love to have been there to attend this conference happen live. 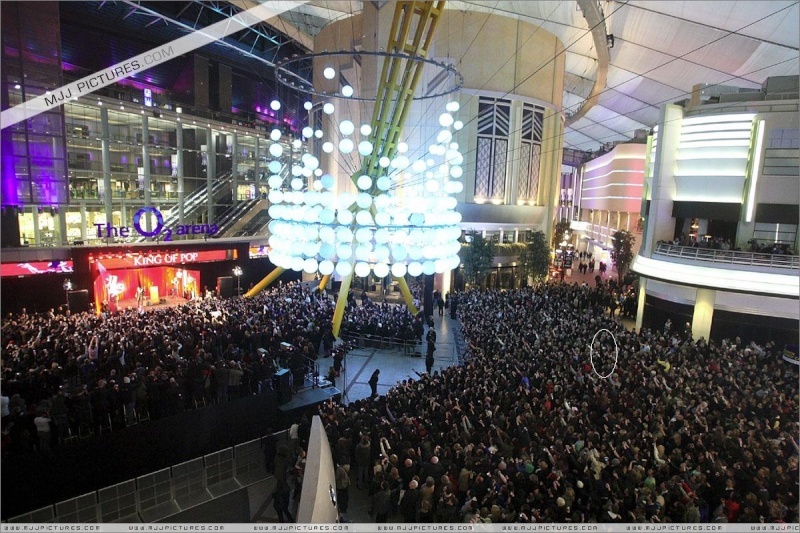 jesus that tiny bit how crap for the huge concerts didnt realise that small part? no way he makes history floating history stature he is big news this is ridiculous real making history is wen he comes back from the dead i think thats wot its about got to be cos thats shockingly small and crap for king of pop mj a square?? come on!! I think the 02 conference was real..
yeah just saying an act for the hoax tho he was never doing them hence small advertising no costs why waste money makes sense!